Top all-India trade unions (TUs), including left-wing All-India Trade Union Congress (AITUC) and Centre for Indian Trade Union (CITU), Congress' Indian National Trade Union Congress, socialist Hind Mazdoor Sabha (HMS), and others, were joined by civil rights organizations to sharply criticize the Gujarat government for going out of the way to support the Tata Nano management in the 20-day-old strike by about 450 skilled technical workers. 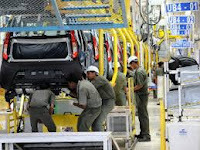 The strike has acquired significance, as it takes place amidst reports that Tata Nano – which Prime Minister Narendra Modi during his chief ministership of Gujarat “snatched” from West Bengal chief minister Mamta Banerjee – is failing to be a successful car. Ever since the strike began, the production for Tata Nano is said to have come to a standstill. According to a calculation, Modi allowed a concession worth Rs 30,000 crore to woo Tata Nano from Singur in West Bengal. Problems began when two workers were suspended close on the heels of an application with the Gujarat labour commissoner around Diwali last year for setting up a registered trade union at the Nano plant, situated in Sanand, about 12 km from Ahmedabad, another 26 workers were suspended two months later when the workers went to find out what happened to the promise their colleagues would be taken back. In a statement issued soon after a meeting at Ahmedabad's All-India Bank Employees Association (AIBEA) office, the Central and Gujarat-based TUs lent their strong support to the demand of the Tata Nano workers for allowing their democratic right to protest, which, it said, was sought to be undermined by the state government by declaring the strike as illegal and resorting to bringing police pressure in order to crush their right to strike and protest. The meeting, in which nearly 423 of 475 striking Tata Nano workers participated, saw the Tata Nano plant's newly formed union, Bharatiya Kamdar Ekta Sangh (BKES) a secret ballot to ascertain if the strike should. “All but one said the strike should continue till the suspension of all 28 workers was revoked”, said Hiteshkumar Rabari, president of BKES. The ballot took place following the failure of any compromise through the mediation of the Ahmedabad district collector on Friday between Tata Nano workers and the management. During the meeting, the district collector said the union leadership was “pressuring” their colleagues, one reason why they are on strike. “We told the collector that the strike is totally voluntary. We also invited him to oversee the secret ballot on whether to continue with the strike or not, which took place today. However, he never turned up”, union secretary Umeshkumar Rathod said. The “compromise” suggested during the negotiations was that the strike would end, and the inquiry into the “misconduct”, being carried out by a third party chosen by the company, would continue for three months, based on which the fate of the 28 workers would be decided. During this period, the workers would be paid 50 per cent of the salary. This was not acceptable to the union leaders.